Discussion in 'iPhone and iPad Games' started by Techzamazing, Jun 24, 2016. Now FREE for the FIRST TIME EVER! 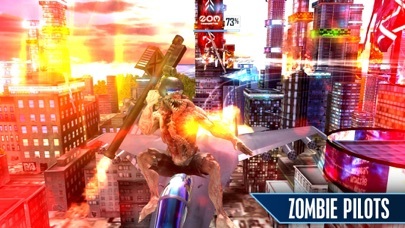 ON-RAILS action awaits you through your journey of 20 Zombie-Filled missions, as you master Tilt Controls of 5 unique Jet Aircraft. 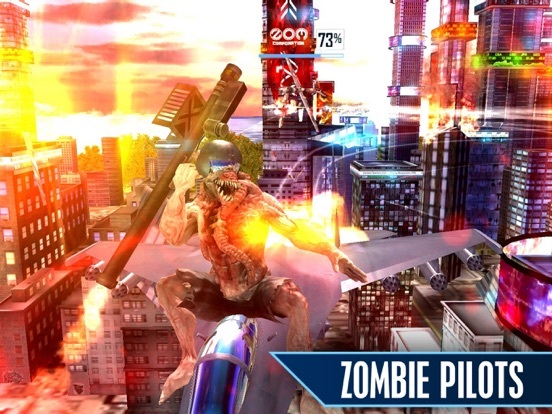 Stop the evil ZOM Corporation and their army of Zombie Pilots in this action packed arcade style shooter, EXCLUSIVELY on the iOS! Featuring: • Ability to defeat or team-up with different types of Zombies, including: Evil Zombies, Friendly Zombies and Crazy Zombies. 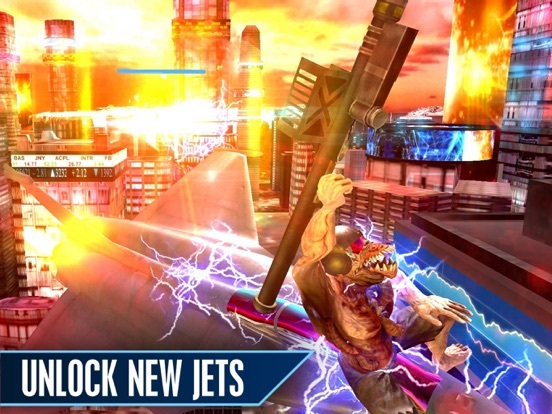 • Use the destructible city environment to your advantage, as you set Zombies on fire, electrocute them, or guide them towards spinning propeller blades! 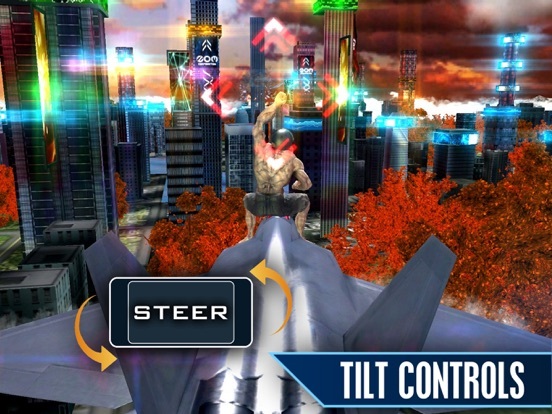 • Featuring simple and Intuitive Controls: tilt your iOS device Left and Right to steer your aircraft around city obstacles while skillfully avoiding enemy missiles. 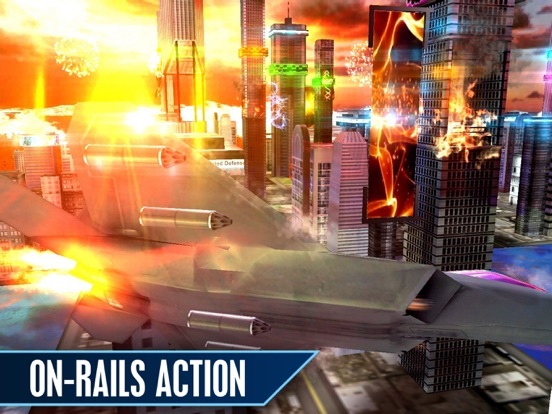 • Alternatively, for a casual ON-RAILS experience: forgo tilting and simply tap your enemies to engage the "Autopilot" while controlling your Afterburner and Weapons with a smooth 2-button interface. • RPG Style Progression System allows you to FREELY acquire and level-up 5 unique Jets while unlocking 30 different types of Afterburner and Weapon upgrades. • Avoid certain destruction with instant Emergency Repairs! Earn them by successfully completing missions. • Face a variety of modern aircraft enemies, including: jets, attack helicopters and GIGANTIC money-packed transport aircraft! • Game Center support: with 9 Leaderboards and 22 elusive Achievements that demand an additional 10+ hours of game play. • Adaptive AI and Randomized Enemies with Dynamic Difficulty: provide for a near endless replay value, as your opponents constantly change and adapt to your style of game play each time you engage a new or existing mission. • Skip the RPG grind with OPTIONAL In-App Purchases that let you instantly unlock and level-up all playable aircraft inside the game. >> Game Play Basics: Steer your Jet Fighter manually by tilting your device left and right, or tap your enemies to engage the ON-RAILS "Autopilot". NOTE that you must be facing your enemies directly before pressing the right "Weapons/Fire" button. 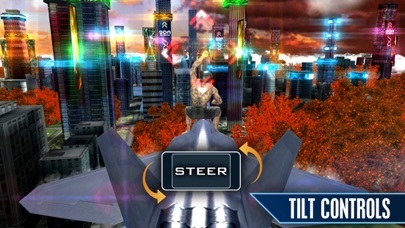 Holding the left "Afterburner" button will allow you to avoid enemy missiles as well as steer around various city hazards. 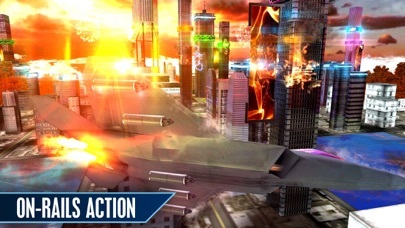 Remember that the game's Dynamic On-Screen Tutorial System will always guide you on the right course of action, while prolonged use of the Weapons/Afterburner will cause a temporary overload. Also, note that your Jet Fighter is equipped with automatic repair systems which will activate shortly after you stop taking damage. Completing missions, earning XP and leveling-up your HD Jet Fighter to Level 5 will unlock new playable aircraft for FREE. You may also skip the RPG grind and instantly level-up via the use of optional In-App Purchases. 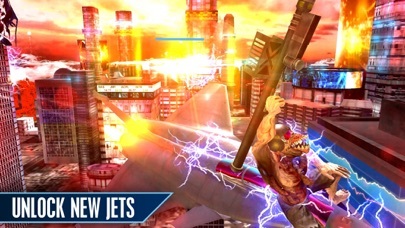 Each In-App Purchase can also be Restored, thus allowing you to instantly unlock playable fighter jets on multiple iOS devices.